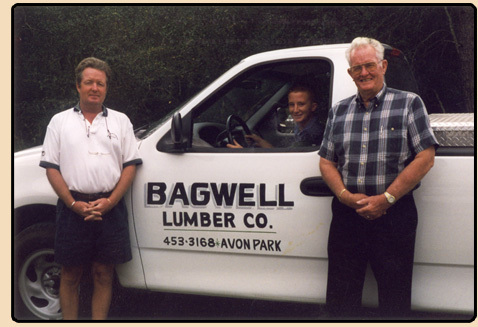 The story of Bagwell Lumber finds it origins in Fletcher, North Carolina. W.C. Bagwell first arrived in Frostproof while vacationing in Florida. During his stay he observed a need for the people of the area to acquire building materials at a much higher demand than was currently available. The decision was made to create an establishment in which this could be done. As the area began to grow, the neighboring community of Avon Park began to see a need for more commercial and residential building materials. It was at this time, Tommy Bagwell opened the Avon Park lumber yard in August of 1957. Three generations later Gary Bagwell now helms the operation working side by side with his son Dusty (fourth generation) to continue one of the area’s oldest family businesses. Tragedy struck during 1998 in the form of a large fire and our main building was completely destroyed. Determined not to allow any slowdown in our efforts we immediately moved into our warehouse. We are proud to have been able to rise above this incident due to the support of our customers, employees, and friends. Pictured from left to right: Gary Bagwell, Dusty Bagwell, Gary Bagwell Sr.
We take great pride in supporting our area’s community through churches, schools, and local organizations such as the Highlands County Builder’s Association. Bagwell Lumber is also a proud sponsor of the oldest Junior Golf event in the state of Florida, the Bagwell Junior Golf Tournament. The American Dream is something we feel strongly about, as we are living it each and every day. It takes a considerable amount of hard work which is why you can always find a Bagwell family member working at our store. In addition, some of our employees have also been with us for more than 30 years. Our outside and inside sales staff work together in tandem to help meet our customer’s ever evolving needs. This year Bagwell Lumber of Avon Park Inc. is proud to announce the celebration of our 53rd year in business. We would like to thank all those in front of, and behind the counter whom without their patronage, this wouldn’t have been possible and we look forward to our next 50 years with all of you! Bagwell Lumber Co. of Avon Park Inc.